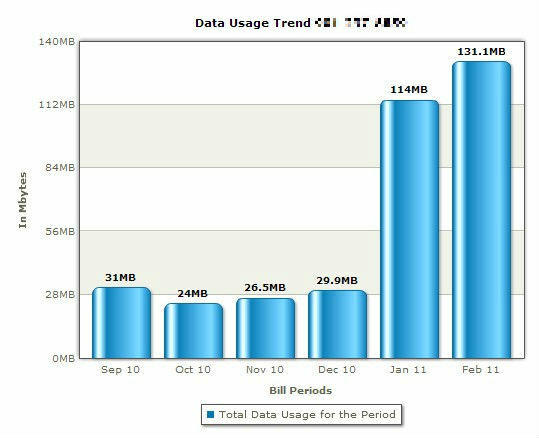 I've had my AT&T Captivate (Samsung Galaxy S) for almost 2 months, long enough to get an insight into the bandwidth usage. 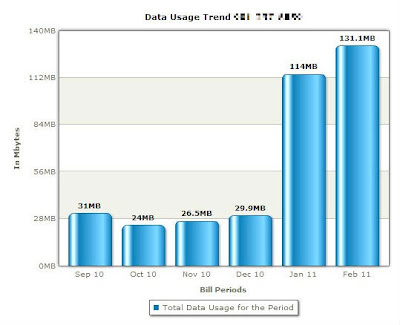 AT&T does a good job of tracking the usage and presenting it in an organized manner. My wife now has my BlackBerry Curve using it for her work e-mail. She doesn't really use any other data on it. 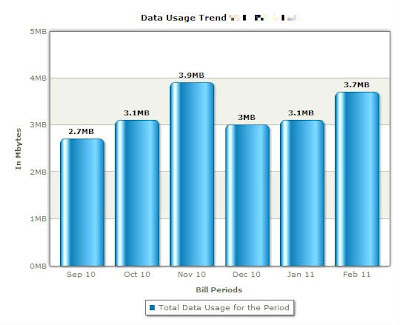 Here's what the last 6 months of her data usage looks like. Look carefully at the units down the left axis. It pretty well tops out just under 4 MB per month. Now here's my last 6 months of data usage. The first 4 months are on my BlackBerry Bold and the last 2 on the Samsung Captivate. 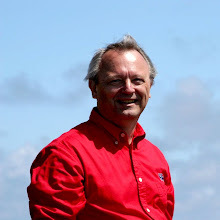 And I have the Captivate setup to use Wi-Fi wherever possible. I don't stream anything. I download podcasts but I have that set to only download using Wi-Fi. I have the grandfathered AT&T "unlimited" plan. Even so, I'm well within the currently offered 2 GB plan. Still, that's a huge jump in data traffic.